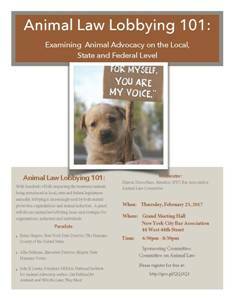 The Animal Law Committee is the nation’s first bar association animal law committee. 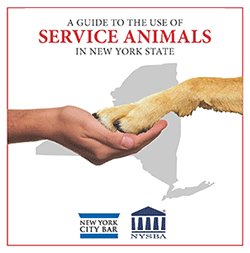 It regularly addresses legal, regulatory and policy issues on local, state, national and international levels affecting non-human animals, both wild and domestic. At the NYC level, the Animal Law Committee has taken positions on issues such as horse-drawn carriages, pets in housing, anti-tethering of dogs and use of wild and exotic animals in entertainment. At the state level, the Animal Law Committee has taken positions over the years on many issues such as animal cruelty, animals in entertainment, wildlife conservation, animals in the military and law enforcement, shelter adoptions, consumer law, concentrated farming operations and confinement of animals, canned hunting, force feeding of animals for foie gras production, electrocution of fur-bearing animals, tail docking, devocalization of companion animals, and required fire safety for animals kept by pet dealers. At the federal level, the Committee takes positions on matters governed by statute (e.g., the Animal Welfare Act (treatment of animals in research, exhibition, transport, and by dealers), the Animal Enterprise Terrorism Act, the Endangered Species Act) and on bills relating to consumer law and labeling of animal products, animal health, welfare and safety (e.g., horse slaughter, sanctuary for primates used in experimentation, non-therapeutic use of antibiotics on animals). At the international level, the Committee has commented on the Convention on International Trade in Endangered Species of Wild Fauna and Flora. Memos are regularly submitted to incoming administrations in New York City, Albany and Washington, DC.